Your trip will start with a scuba diving lesson from an experienced PADI Scuba Instructor. If you have never tried scuba diving before you will get a thorough safety lesson on the way out to the dive site. Certified divers are encouraged to participate, especially if it has been a while since you have been underwater. 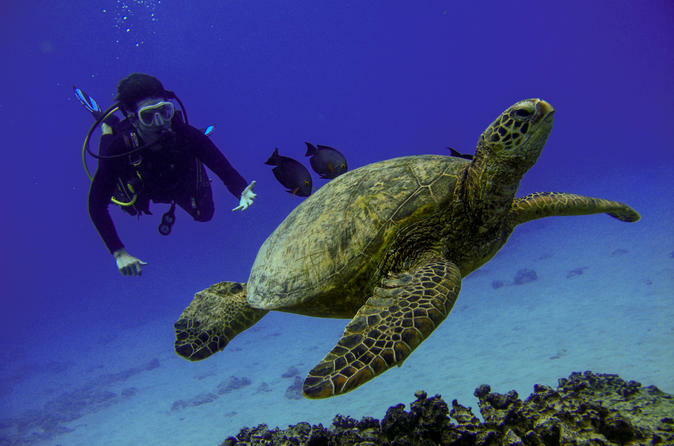 Once the boat gets to the first dive site you will be able to get in the water and practice what you learned before heading deeper to explore a beautiful Hawaiian coral reef. With small groups of no more than 4 divers per instructor you will never be far away from one of our experienced guides.